This is a picture of the problem I'm having. I'm trying to replace the front brakes and usually it's 2 bolts one at the top and one at the bottom, that you would undo so you can take the brake pads off. Now I did the back with no problem. When I go to do the front it's only one bolt and at the bottom where the other bolt would be it's some type of rubber piece. How do I replace the brakes with that type of set up? I moved this tread to the tech questions thread so people should see it better. I have also deleted your duplicate thread that was put in the "site feed back" section. Pop cap off that boot. 6mm hex. Unbolt it. 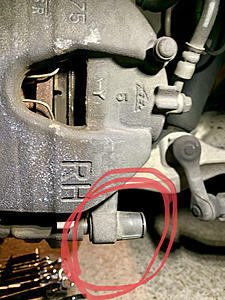 Brakes are off assuming the top bolt is off. As hash said. Help G37xS Sedan brakes... Sport brakes or X brakes??? Quick Reply: Help with brakes!! !